Just barely two hours ago we ran what we thought was the first, and only, teaser poster for The Wolfman. It only had Emily Blunt on it, so we thought Universal didn't know what they were doing. However, Ain't It Cool News has just exclusively debuted yet another teaser poster for The Wolfman and it is quite badass. I thought about just updating that old post, but when I actually got a glimpse of this, I thought it deserved its own entire post. Sure it looks a bit noir, but this poster is truly impressive, I love it. It's simple, it's dark, it's sinister, it's pretty much perfect. Hell, throw out that other poster, this is all they need. Check it out below! The Wolfman is directed by visual effects Oscar winner Joe Johnston, of Honey I Shrunk the Kids, The Rocketeer, Jumanji, October Sky, Jurassic Park III, and Hidalgo previously. The screenplay was co-written by Andrew Kevin Walker (Se7en, 8MM, Sleepy Hollow) and David Self (The Haunting, Thirteen Days, Road to Perdition). 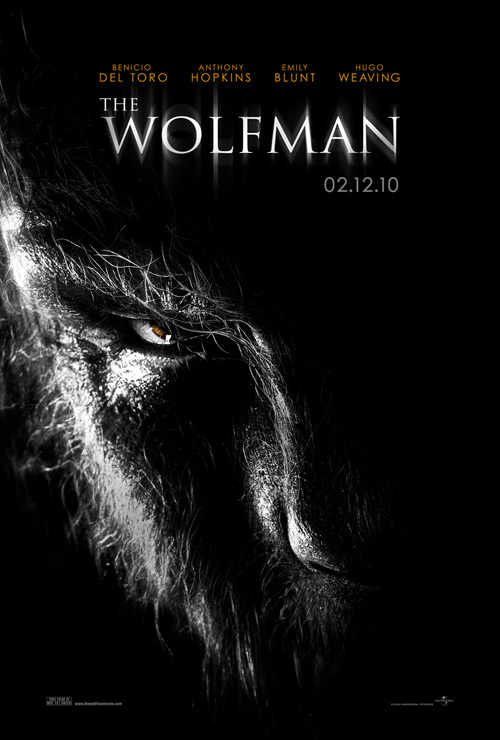 Universal will be bringing The Wolfman to theaters on February 12th, 2010 early next year. More common, but great shot. I like the other personally. It was all suspenseful because you didn't know where he was but you knew he was chasing her. The other poster was better! Last one felt too 'taken from the movie', feeling like it was just taken, photoshopped, and posted. I can understand of "ooooh, I don't know where he is" kind of suspense, but its HER presence that's supposed to communicate that. She needs to be grasping the tree with her hand rather than just in front of her. With a bit more execution towards this kind of poster, they could have been more successful. What was up with that other poster. If you're promoting a movie called the wolfman you should probably put the wolfman on it. That could just be me. What's so "perfect" about this? You're the one that doesn't seem to know what he's doing. And do you even know what noir means? You make it sound like its a flaw. I love this site because you make dumb look smart. Yall are freakin' vicious with your attacks on Alex. Damn. Anyways, I like both posters, but I still lean towards seeing Emily Blunt in a corset... I AM a guy after all. Plus, this doesn't show off The Wolfman enough. I like it, but it looks way too simple and like many other posters I've seen. They could've tried something different. Lame, a cliche horror film poster. I think we have seen almost any horror villain in history from this angle. This look's agood poster for Wolfman, there is somthing Dark and siniter about this poster cannot wait. Whoa!! That is so incredibly awesome! I love it. Others are complaining that it's too simple, but that simplicity's what makes it so cool. I'm cautiously optimistic. Hoping for something brilliant, nervous that it will be another Van Helsing.